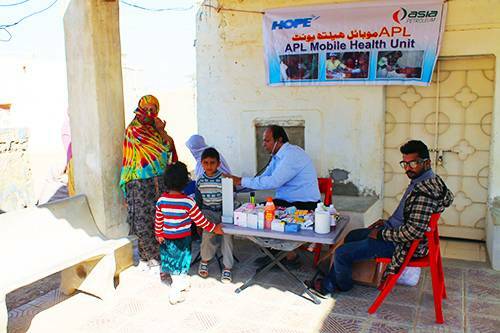 APL in collaboration with a NGO operates two Mobile Health Units (MHUs) providing primary health care services to the residents of more than 10 villages in the vicinity of APL’s pipeline. Both units are led by a qualified doctors accompanied by dispensers. Free consultation, treatment and medicines are given to patients mostly women and children. More than 40,000 patients per annum benefit from these facilities. 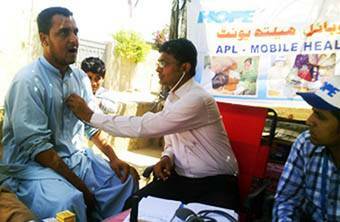 A Basic Health Unit (BHU) was operated by APL at Soomar Goth. This facility provided primary healthcare facility to patients from Soomar Goth and surrounding villages. Through a qualified lady doctor and dispenser, the unit offered free consultation, treatment and medicines. Majority of the patients were women and children. For larger scale health impact the BHU was replaced by MHU. Medical camps conducted have provided free consultation and medicines for common ailments and epidemics. Depending upon the need, relevant tests (eye, blood, sugar, etc.) were carried out by qualified medical specialists such as optometrists, gynecologists, pediatricians, ophthalmologists to dermatologists, etc. and where required, patients were referred to and given secondary health services.